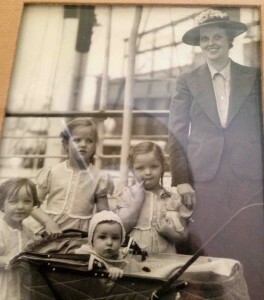 Lois Bechtle at 10 months old with her mother and three sisters boarding a ship to Pasto, Colombia. In May 1941 at just 10 months old, Lois Bechtle arrived in a little town called Pasto in the Andes Mountains of Colombia. Her mother, Katherine, known as Señora Catalina, had returned alone with her four children from New Jersey to continue her late husband, Lester Morgan’s missionary work. He had pioneered five churches in Colombia, but had fallen gravely ill, which caused the family to return to New Jersey where he died four months after Lois’s birth. In a bustling five-bedroom home, Lois grew up learning Spanish as her first language. The house served as a clinic and counsel for the sick, poor and mentally disturbed. As a child, Lois assisted her mother in medical and dental procedures. She pulled medical instruments out of a bag, mixed concoctions and held the patient’s head. 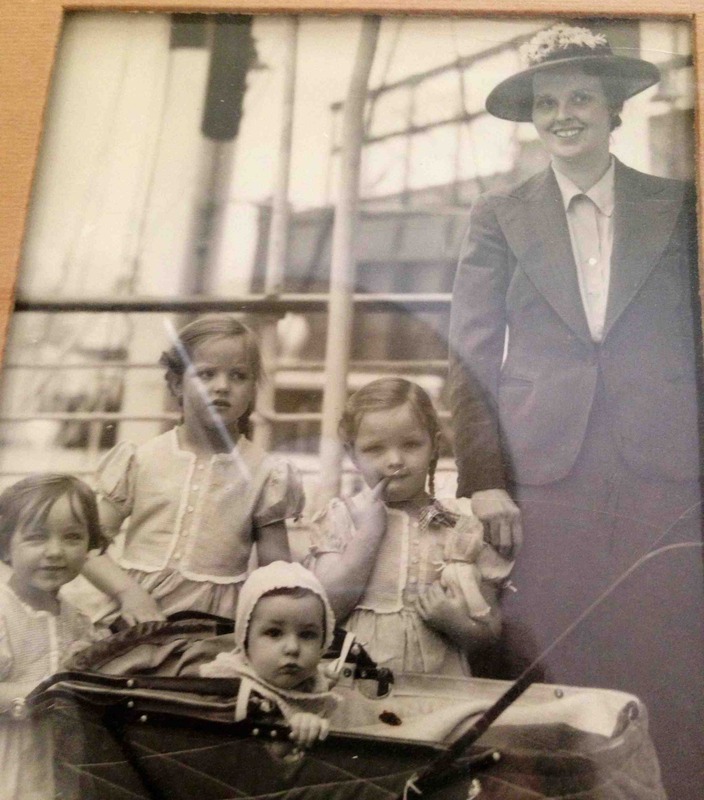 Lois and her sisters travelled everywhere their mother was called. They went on horseback deep into the Andes Mountains to care for people in need, or on canoes on the Amazon River into the jungles to to plant new churches. 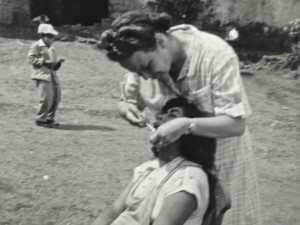 Señora Catalina, Lois Bechtle’s mother, treating a patient in Colombia. When Lois was eight years old, political turmoil struck when the Colombian president was shot during the revolution. At that time, townspeople gathered in the streets shouting, “exterminate the protestants.” Four hundred people marched in rage shouting, “kill the protestants.” They surrounded Señora Catalina’s home. Her mother, unfazed, walked out onto the balcony and confronted the crowd by unfurling a Colombia flag. Eventually, the army came to disburse them. Senora Catalina became a legend in Colombia and America. Harvard scholars studying the Amazon would stay at the house. There was always lively discourse at the dinner table. A teacher from North Carolina came down to teach Lois, her sisters and other American and European children in Pasto. It was then and also on trips back to New Jersey that Lois became acquainted with English and American culture. Lois recalls being in shock of all the cars and traffic upon arriving in New Jersey. On Sunday mornings, they visited the local churches. Lois and her three sisters would stand in a row in front of a wide audience as their mother shared the stories of her missionary work. 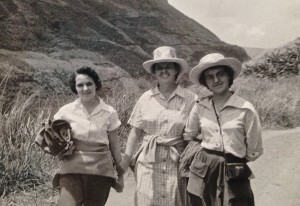 Lois Bechtle, her mother and her sister in Colombia. In 1956 at 16 years old, Lois suffered a shot of culture shock when her mother sent her to live with her grandmother in Bloomfield, New Jersey to finish high school. She felt as though she had been dropped down from Mars into a scene from “Happy Days,” the 1950s television show. Lois was out place from head to toe. She would walk to school with the only African American student because they were both so unique in a world that idolized sameness. She gained 40 pounds in the first year living away from her mother and the close-knit life among her sisters in Colombia. After graduation, Lois attended Houghton College to obtain her nursing degree and then went on to Columbia University in New York City to complete her Bachelor’s Degree in public health nursing. From 1961 to 1963, in the heat of the Kennedy years and the Civil Rights era, Lois encountered vocal, angry students, the Black Panther movement outrage that sparked her to ask why they were so angry. She had not grown up in America with this tangible divide between black and whites, but she had experienced discrimination as a minority in Columbia. “I was still very naïve, yet I was very strong in my beliefs and principles that turned out to draw a wonderful, special group of friends to me,” she said. 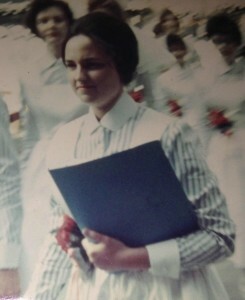 Lois Bechtle, of Hospice Care of the West, as a young nurse. As a young nurse, she began working for a public health clinic in Spanish Harlem. She recalls recognizing the symptoms of a person with leprosy before anyone in the clinic could figure out what the patient suffered from, as her mother brought treatment for leprosy, tuberculosis and mental health to Colombia. “I felt in my element. I could speak to the patients and it was very clear to me I had found where I had value,” Lois said. Around that time she began to ask God for the man she would marry. “I prayed for a man who would honor God, a man who was stronger than I am, and that meant he had to be really strong and a man like my father, who I admire,” she said. Around 1965, she became reacquainted with Sam Bechtle, the son of her mother’s dear friend in New Jersey. Sam knew of the legendary Katherine and her daughters from the presentations her mother would make at his church. At the time, Sam was a mechanical engineer and he spent his weekends in youth ministry helping out poor children and driving them by bus to church on Sunday. Some of the children called him Dad. Lois and he shared so much in common that she just knew this was the man she had been praying for. 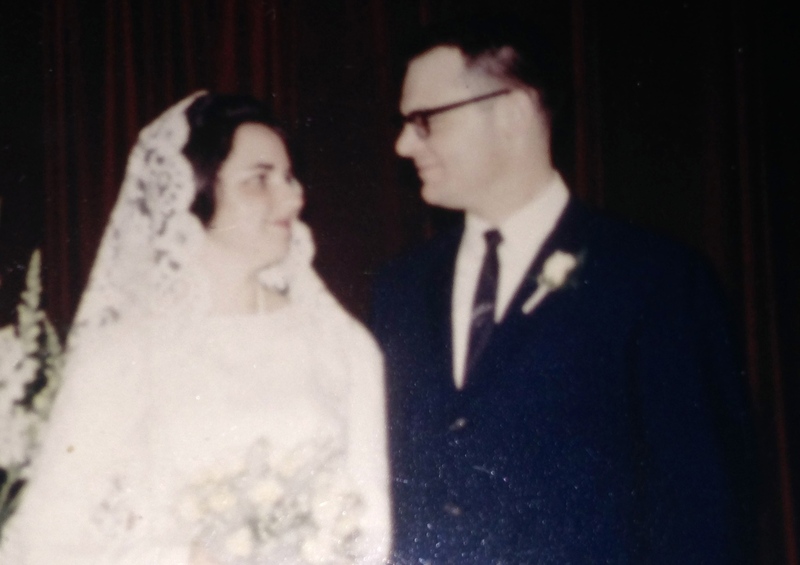 On April 15, 1966, they married and honeymooned in Puerto Rico. Upon their return, she moved to New Jersey and they bought a house. For two years, they tried to have a baby. She yearned to be a mother. Lois and Sam started the process of adoption. They were told it would take five years. In a miraculous turn of events, four months after they filed the paperwork, Jonathan was born. They picked him up from the hospital on Dec. 10, 1969. “I took time off of work and just held him and loved him for nine months without stopping,” she said. Lois and Sam Bechtle on their wedding day. Three months into her time off, Lois became pregnant. The birth of Helen was an absolute miracle. Shortly after, they were blessed with another miracle when Katherine was born. The family moved to Chicago and then Sam received a job in Puerto Rico for Abbott Laboratory. In Puerto Rico, Lois started a Bible study and then a church for the group of expatriates living in their village. After Puerto Rico, the family moved to Mission Viejo where the children grew up and attended public school. Lois taught them to stand up for what they believe in. She supported their sports, drama club and watched them in awe grow up to become amazing Godly people. Lois began working again as a per diem nurse in 1978 at Saddleback Hospital. Each year, as a family they served as counselors to abused foster kids at Camp Allendale in Idylwilde. They became so close over the years to one little girl Komisha, who became a part of their family after she turned 18 years old and aged out of the foster system. Not long after, following the footsteps of her mother’s pioneering spirit, Lois took on a Director of Nursing position at the first hospice, Community Hospice, in Orange County in 1992. Deb was so thrilled to be a part of this new organization; she sent Lois a bouquet of flowers to say, “Thank you.” They served many years together shaping the way hospice was delivered to patients in Orange County until Community Hospice was bought out by VITAS. They went their separate ways until more recently when Lois joined Hospice Care of the West as a Quality Assurance Performance and Improvement Coordinator after retiring for a year in 2009. Today, they work together again here at Hospice Care of the West, where these hospice pioneers of Orange County continue to raise the bar and evolve how we serve our patients in hospice care. Looking back over her life, Lois feels amazingly blessed. Today, Jonathan is a pastor and father to three girls and one adopted girl, Helen is a journalist and mother to one boy and two girls and Katherine named after Senora Catalina is a nurse and mother to four adopted girls. Lois passes on this wisdom to her three children and 11 grandchildren. Thank you Lois, for sharing your life with us that exemplifies faith. It was an honor to interview you and discover your life story. I felt as though I walked back into time to experience a true state of faith.